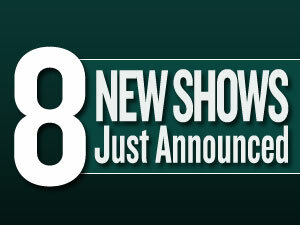 We just added eight new shows to our concert calendar. A celebrated singer/songwriter from the UK, David Gray has … click here to read more. Rock guitarist, saxophonist and singer/songwriter Eddie Money arrived … click here to read more. From his origin in a small town in Japan, country music fiddler and singer … click here to read more. One of the most long-lived and successful vocal groups of the 1960s … click here to read more. “Lady,” “Ruby Don’t Take Your Love to Town,” “The Gambler,” “Lucille,” … click here to read more. A full evening of entertainment and meaningful music is a rare treat anytime, but … click here to read more. For more than four decades, Engelbert Humperdinck has shared a legacy … click here to read more. Under the Streetlamp, America’s hottest new vocal group, performs an … click here to read more.